double disc surface Diamond grinding wheel diameter380-1200mm be suitable in double side or single side grinding machine for high precision lapping and grinding Parallel grinding wheel 6A2T 2A2T 1A2 1.Longer tool life ,20%-40% higher than others. 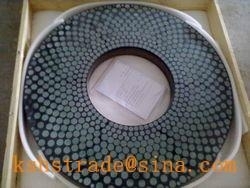 2.Effective grinding, good in self-sharping, low in heating, uneasy to be blocked, easy grinding action. 3.The most professional advice for you. Our technicist have abundant professional experience.